AllStar DVD Photo Slideshow is the best DVD photo album software to create Video-DVD's from your photos to watch on TV. Share your digital pictures on a DVD with friends or family. Turn your photos into slideshows complete with music, transitions, captions, narration and stunning effects in only three steps. It support pocture formats: JPG, GIF, PNG, RAW, BMP, ANI, PCX, EMF, WMF, etc. 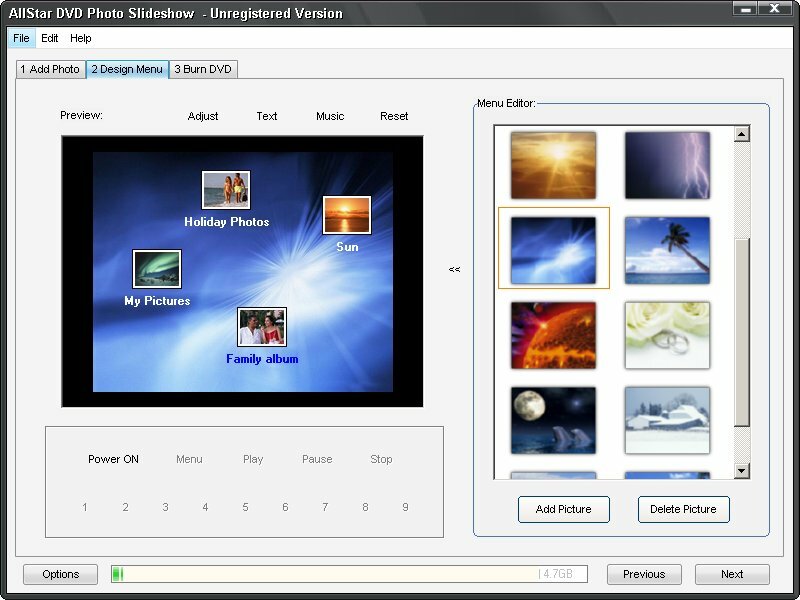 It can help you create personalized DVD menu. ...... TV as high resolution DVD photo album. * Powerfull Photo Editor, you can adjust/rotate/cut your photos. * Powerful menu designer helps you create personalized DVD menu. * Multiple output formats enable you to share your happiness on TV, computer, DVD player. Or you can save your project to ISO File/DVD Folder. * DVD output on DVD-R/RW and DVD+R/RW media (Single or Double Layer). * Fullscreen (4:3) and Widescreen (16:9) output. * Beautiful pan and zoom effects. * Supports both PAL and NTSC formats. Qweas is providing links to AllStar DVD Photo Slideshow 4.21 as a courtesy, and makes no representations regarding AllStar DVD Photo Slideshow or any other applications or any information related thereto. Any questions, complaints or claims regarding this application AllStar DVD Photo Slideshow 4.21 must be directed to the appropriate software vendor. You may click the publisher link of AllStar DVD Photo Slideshow on the top of this page to get more details about the vendor.